Kottarakkara Ganapathi Temple is one of the important Lord Ganesh Temples in Kerala, situated in Kottarakkara about 25 km from Kollam and 72 km to the north of Thiruvananthapuram. The temple is around centuries old and is now one of the famous pilgrim centers in South India. Kottarakkara Ganapathy Temple was previously known as Manikandeswaram Mahadeva Temple or Kizhakkekkara Shiva Temple, as Lord Shiva is the main deity worshipped here. However, the shrine is renowned for the deity of Lord Ganesha who according to legends was not installed as per the tantra (spiritual practices and ritual forms of worship) rituals. Kottarakkara Ganapathy Temple is said to be the birth place of Kathakali, the popular classical dance-drama form of Kerala. 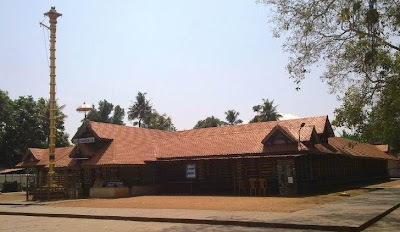 Kottarakkara Ganapati Temple is built in the Kerala style of architecture. The Sreekovil (sanctum sanctorum) of the main deity is round in shape, with its roof thatched in copper sheets. The idol of Lord Shiva faces east; His consort Goddess Parvati, known as the Padinjattu Bhagavathi, is located behind the sanctum sanctorum facing west. Lord Subrahmanya faces north-west and Lord Ayyappa (Sastha) in the south-west with Nagaraja and Nagayakshi installed in the kannimoola (south-west corner). A huge lake found in the eastern side of the temple is an added attraction. The idol of Lord Ganesh, facing south-east, is carved in wood. This 3 feet high figure is seen with a small trunk and four hands, carrying coir, hook, rice cake, and plantain fruit. He wears a chain with beads of rudraksha on the neck and a golden pendant on the forehead. There is an 18 feet high bronze deepasthambam (pillar of lamps) with five circular plates for holding the lamps. According to legends, the idol of Lord Ganesh was installed in the temple by Perumthachan, the master craftsman. On creating an idol from the roots of a jackfruit tree, the craftsman asked permission from the chief priest of Pandinjattinkara temple to install the idol there. However, his request was denied by the priest. Alternatively, Perumthachan obtained permission from the priest of Kizhakkekara Shiva Temple and he installed the idol there in the south-east direction. Perumthachan considered the shrine as Kailas (the abode of Lord Shiva) as the temple enshrines all the family members of the Lord. A unique feature of the temple is the offerings made to Lord Ganesh. He is offered with Unniyappam or Koothappam, a foodstuff made from rice powder and Jaggery fried in oil. Legend says that this offering was made by Perumthachan to the Lord on a plantain leaf, when he noticed that Lord Ganesh was starving for food even after consuming Aval (flaked rice) from his father, Lord Shiva. Other important offerings include Udayasthamaya Pooja, Ashta Dravya Ganapathy Homam, breaking of coconuts, Thulabharam (a ritual in which the devotee submits offerings equal to his weight), chathussatham, Thrimadhuram (offering made of three sweets), archana (offering of prayers to god by reciting his name with flowers/leaves/vermillion) and Pushpanjali (offering of floral garlands to deities). Thiruvathira Festival is held annually during the Malayalam months of Meenam - Medam (April/May). The festival starts with the hoisting of temple flag on the day of Thiruvathira and lasts for 10 days with attractive ceremonial offerings, grand processions accompanied by musical instruments, and a variety of entertainments including Kathakali. Vinayaka Chathurthi, the birthday of Lord Ganesh, is celebrated in a grand scale. It falls on the fourth day of the bright half of the Bhadrapada month. This falls on the Uthrattathy Nakshatra during the Malayalam month of Makaram (January-February). Major events held during the festival are Bhagavatha Sapthaham, Devibhaghavatha Navaham, and Annadhanam (free food distribution). Besides, Ayilyam-Makam (special poojas for the serpent gods), Thai Pooyam, Sivarathri, Navaratri and Vishu Festival are celebrated here. Kottarakkara Ganapathi Temple can be easily reached through rail, as it is only half a kilometer from the Kottarakara Railway Station. The nearest airport is at Thiruvananthapuram International Airport, which is about 72 km away. KSRTC buses and private bus services are available from all major towns and cities in Kerala to Kottarakara. Sabarimala Ayyappa Temple devotees make it a point to visit Kottarakkara Ganesha during the Manadala Pooja Makaravilakku Festival occassion.